"look how shriveled they've become"
Posted on September 18, 2013, in Poems and tagged #life, #mindful, #poem, #poems #poems #poet #poetry, #poet, #zen, mindfulness. Bookmark the permalink. 21 Comments. Thanks for stopping by and liking my poem. 🙂 Your blog is really cool. Beautiful, Brian. As we age we tend to notice not permanence but transience. A long life still comes to the conclusion that short lives have come to already. And yet there is a permanence in it all anyway, for as C.S. Lewis said, “You’ve never met a mere mortal.” We are all eternal beings. I thank God I’m spending eternity with him. Beautiful and sensitive. Our elders show us how to relinquish graciously the things of youth. We observe in their diminishing the preparations of Heaven. So often it seems that they are taken from this world in gentle increments. But then comes the explosion of light and the Elder Brother. Go on You Tube and look for the recitation “Go Down Death” by Wintley Phipps. Blessings of peace and wisdom to you as well. 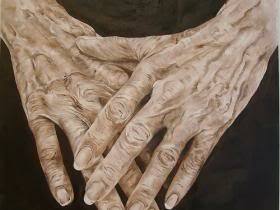 But when you are old and your body doesn’t allow you such grace, we pray for death’s relieving embrace. Who are the coffin dodgers now? My wife’s grandma says she is ready anytime. My grandma left for that place just a few weeks ago. my grandmother passed away August 10 of this year after a long difficult last few days. Well, thankfully, my grandma went in her sleep. Monday, September 2. I didn’t get to spend as much time with her as I liked, but I don’t think that is ever the case. She lived 5 hours away in Oklahoma. I also realize that when my in-laws pass away and my mother, those will be hard times. Yet, in a way, I feel I’ve already been through the worst, because my wife and I lost a child at birth. Its never easy, but you get strong. that’s an incredibly difficult situation to go through. i cannot imagine your pain. do you find an outlet in your writings? Actually, I’m finding that my novel explores dealing with grief. It was consciously intended, but maybe subconsciously it was. Writing music, poetry, and novels have always been outlets for me.